Flinging arrows at archery targets in a controlled environment helps you master the fundamentals of archery. If you’re bored with a sterile target range, grab your stick and string and hit the woods for a dress rehearsal for bow season – or survival. A little stump shooting in a target-rich environment! Stump shooting, for those unfamiliar with the practice, is simply walking through the wilderness, with bow and arrow in hand, and shooting at decaying stumps, dirt mounds, foliage, or other natural targets. I use to go stumpin’ often in my younger days. Those were some fun adventures! I still enjoy stump shooting. 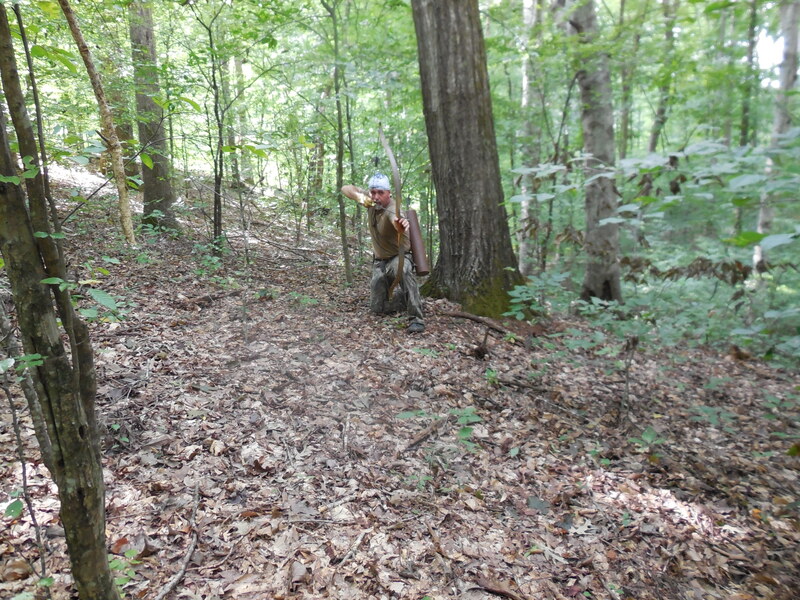 However, as archery season gets closer, stumping becomes a bit more serious. If you are averse to killing game animals in good times, learning how to get close to animals, even if you only shoot them with your camera, is a skill worth adding to your survival set. These are a few ways stumping can benefit your hunting and survival skills. You’re in the woods! That alone offers endless challenges and shooting opportunities. Exercise. You can make it as challenging or relaxing as you like. Try carrying your hunting pack while stumping. Grab a partner and make a game of stumping. Kind of like frisbee golf, only way cooler! Hone your hunting/stalking skills. Practice moving through brush as quietly as possible. Try not to brush against vegetation or limbs. You’ll find yourself in crazy yoga-style positions. I hear yoga is very good for you. Raises your awareness in wilderness surroundings. Practice using all five (six really) senses: sight, sound, smell, touch, taste, and (intuition). Bow hunting requires a totally different skill set than harvesting game with a gun. Estimating yardage without range finders. Varied shooting angles – uphill, downhill, and level. This is useful for those who prefer hunting from trees or stands. Climb a hill to practice shooting at your stand height. Practice instinctive shooting. I shoot with traditional archer equipment. No fancy pin sights. This allows me to acquire my target quickly. I’m shooting a recurve bow (43 pound draw weight) in the above photo with a mix of cheap arrows. 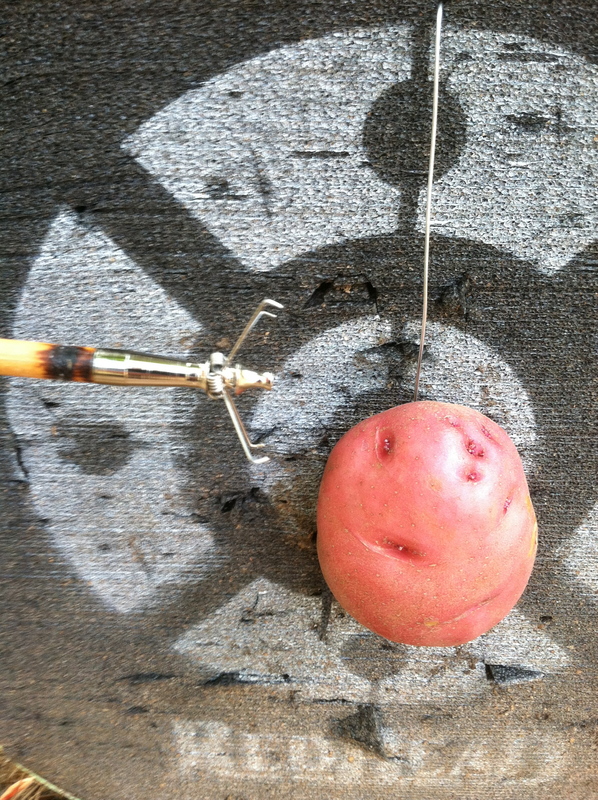 It’s not advisable to stump shoot with compound bows unless you’re sure your target is soft enough. The force generated from modern archery equipment is extreme. If your target is not sufficiently decayed, you’ve just destroyed an arrow. A cheap $2 arrow in a not-so dead stump. Had a time pulling that one. Points for stump shooting can be plain field tips. Judo points and rubber blunt tips are better options. As always, be sure of your backdrop when shooting. Judo point from my Sling Shot Pocket Hunter. The most obvious advantage of archery equipment is noise discipline. You can harvest all manner of game animal with proper shot placement without giving up your position. On the other hand, there is usually tracking involved when shooting larger animals with an arrow. Wandering around the woods with your eyes searching for a blood trail could be a distinct disadvantage. 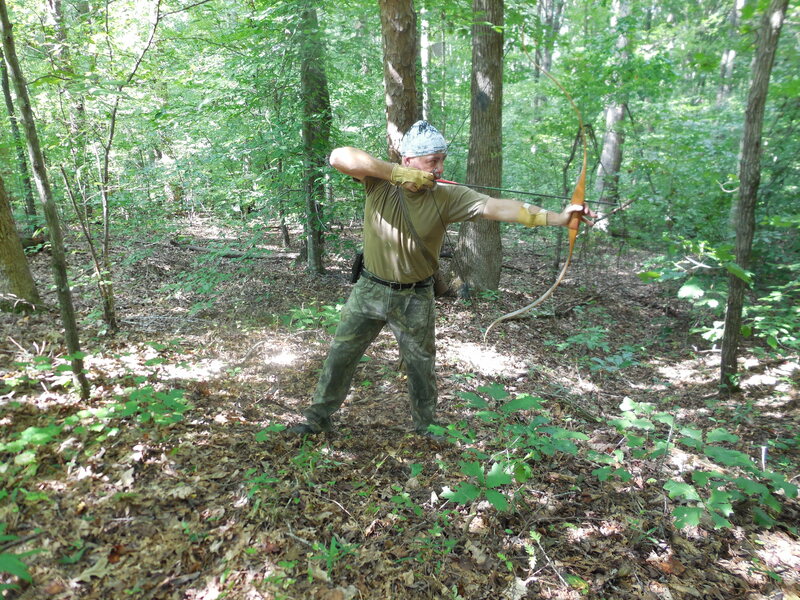 Not only is archery a fun hobby or sport, you now have options in your preparedness plan. And options make you robust and anti-fragile. Buying a bow and arrow does not make you an archer. But it’s a start. Doing the Stuff to build your archery skills may one day swing survival in your favor. Stumping is a one way to practice in real field conditions and can offer survival simulations… even if stumps don’t run away. Primitive bows have been used for thousands of years as weapons for war and hunting. In the hands of a skilled archer, they’re lethal. They do have their limitations, though. What’s your thoughts on the pros and cons of using archery equipment as a survival tool? Share in the comments if you’d like. It looks like a fun way to get off the shooting range and into the wooods! Thank you for the idea. You’re welcome. Great all around family fun! I want you to know that I am contacting my local congressman right now to alert them of this travesty. As a member of the Stump Savers of America we condone the shooting of innocent stumps. Stumps live in our woods silently and harmlessly to human beings. Please dont allow post like this to collect on the internet teaching the bad habits of stump shooting. Please save our stumps. Stumpy, now I know how you got that nickname, you lover of stumps 😀 While I appreciate your love for stumps, I promise you that I make humane kills. They don’t feel a thing. My husband and daughter were shooting arrows at a target. One went over the top and into tall grass. Any tips on finding arrows? We’re a little concerned about the hay guy going in there and ruining his equipment on our arrow. It was only a $5 arrow – where do you find $2 ones? You might want to try a metal detector. I’ve hear of guys taking their dogs in the woods while shooting to retrieve lost arrows. I wouldn’t be too concerned about the arrow hurting hail bailing equipment. They run into sticks all the time. I’ve gotten some cheap arrows from Wally World for around 2 bucks. I also find them at yard sales and flee markets. Hope you find that arrow. keep shooting and thanks for being here! Great post. 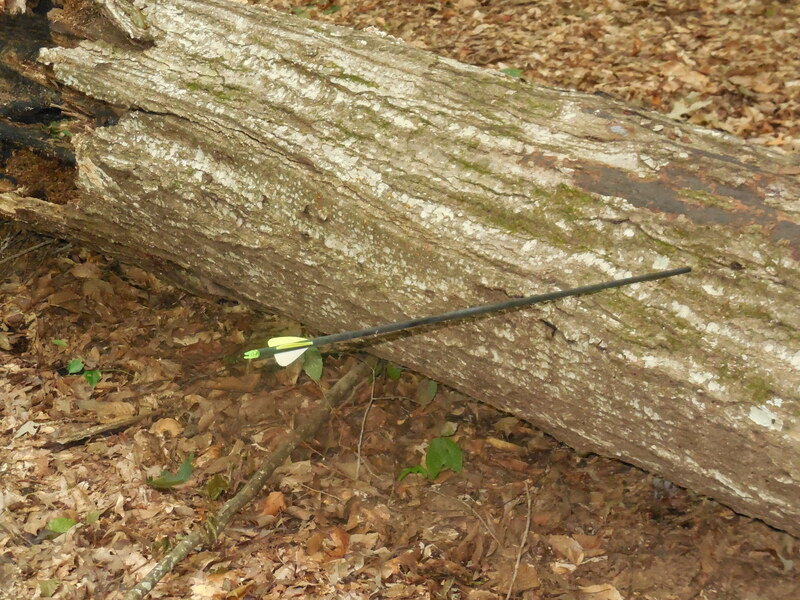 I can attest to shooting a compound bow into wood (by accident) my carbon arrow shattered and the point was 2″ into the wood beam, nothing was reusable. I regret getting rid of my recurve. For people who find they cannot shoot a bow well, buy a cross bow there is a reason many states don’t let you use them for hunting game, its like haveing a silenced rifle. I want a crossbow for those times when silence is needed but added distance, velocity, and energy is need for certain situations. Thanks for sharing your experience! Honestly, any additional survival skill is a great asset. Archery is just so much fun, so why not learn?